There are many stories about Abu Ali Khibbiyeh. He is frequently reported to be dead, although these reports have turned out to be only rumours. Some say he has been reckless on the battlefield. Others praise his courageous and chivalrous nature. In Douma’s streets, opinions differ and tales vary between Khibbiyeh’s negative and positive attributes. I am not assessing the Douma Shield Battalions (DSB), or its leadership, but all that I hoped is to talk to Abu Ali Khibbiyeh about some of the points that he never talked about, despite frequent media appearances. We started the interview by the usual talk about ammunition and the relationship with the military councils and coordination between the battalions. He says ammunition for the DSB comes from individual and limited sources, and they do not even pay monthly salaries for their fighters, like other brigades and battalions. Maybe ammunition is not the only issue that determines a civilian fighters’ relationship with the military. People say the fighters do not like defectors from the government forces and seek to “remove” them. Defectors in turn deal arrogantly with non-military commanders. This is what is said, and perhaps it is “newspapers talk.” However, we cannot think of this in light of the near total lack of defectors on the level of leadership in a large number of brigades and battalions in the area, and of the suffering resulting from poor planning and coordination with regard to military operations, even in the same area. “We have defectors in the battalion. I do not believe in the officers. The regime is still in their minds. There are also agents sent by the regime to penetrate us. At the beginning of armed action in Douma, we were all civilians, with no officers, but we accomplished much and are still able to. It is true that there are great officers, a large number of them were martyred, and I do not have the right to evaluate people on the basis of defector or volunteer, but laggards are refused,” Abu Ali says. The issue of defectors emerged again after a decision was issued with regard to weapons that are supposed to be delivered to fighters in Syria. It is said – I could not confirm it from a direct source – that these weapons will go only to the battalions led by defected officers. Abu Ali says they learned that new weapons arrived to one party in East Ghouta led by a defected officer, but their battalion has not received anything until this moment. Regarding the lack of planning and military strategies of the battles, we talked about entering Medan neighbourhood in Damascus, which was labelled a military mistake and a reckless decision for which Abu Ali Khibbiyeh was blamed. In any case, Abu Ali thinks the root of the problem is the negative developments that have occurred in the revolution over time. I asked about the spread of narcotic pills and hashish in East Ghouta. In the end, Abu Ali says, the right thing is to go back to our faith and our primary goal of the revolution. He is currently working on a project to restructure the “veterans” in one formation in Ghouta. 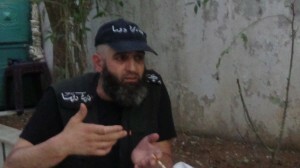 “We intend to start from the Free Syrian Army, ourselves, and be a revolution within the revolution,” he said. Regarding the revolution within the revolution, we talked about battalions’ violations against civilians in the liberated areas, and the negative practices of some elements of those battalions. In particular, we mentioned the many times militiamen carried their weapons in public in Douma, unlike other areas in Ghouta, in addition to some complaints that we heard about the DSB, including spectacular armed manifestation in the streets, driving at reckless speeds, robberies and others. “We recently agreed to unify the prisons in Douma, allowing the military formations to arrest military personnel only, or the accused of dealing with the regime. I began to implement [the agreement] and handed detained women and civilians to the unified prison. In the past, if we wanted to arrest an agent, I did it myself with the elements of my battalion. Today, I ask for a force from the military police to arrest someone, accompanied by elements of the battalion,” Abu Ali says. I told Abu Ali that it is wrong for the battalions to participate in arrests, a phenomenon that has led to many problems, especially when arresting a member of another battalion, which has resulted in clashes between battalions in some cases. I said this task should be exclusively the realm of the police, as is the case in other liberated areas of Ghouta. I asked him how can I file a complaint against any of the DSB elements or leaders. We asked Abu Ali about their relationship with the civilians in the city, in particular about the many services that the battalions provide, which should be the jurisdiction of civic bodies not the military. I asked Abu Ali about the statement announcing the death of Bashar al-Assad, which earned more than 2 million views on YouTube in a few hours. It was then shown that it was not true and we did not hear an explanation from him about what happened, even though many Syrians felt deceived and bitter because of it. The surprising thing is that Abu Ali is still insisting that Bashar was killed and his successive appearance in the media are fabrications made by the regime! I asked him, finally, what he waits for himself in Syria after the fall of the regime. We ask him about the truth of Abu Ali Khibbiyeh. Narratives about him are conflicting, between a very cruel and ruthless person and a person who has a lot of magnanimity and courage. At the end of the meeting, Abu Ali asked to say a word to the rebels and the Syrians.